Solar energy has come a very long way over the years but it hasn’t ever been powerful enough to be able to cook a meal or boil water with a portable device. The GoSun Go changes all of that though, as with just a small amount of space, it can produce an incredible amount of energy. That makes it perfect for many different activities, especially when you are going to be away from a power source for a long period of time. Having the ability to boil water, for example, is not only very useful but it could be life-saving in an emergency. 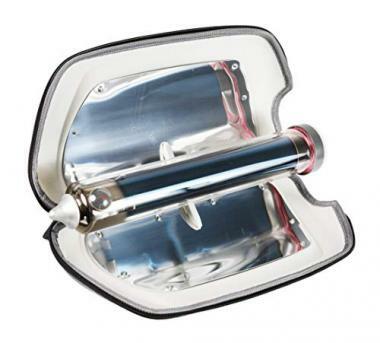 For most of the time though it can be used on trips to give you deliciously hot cooked meals without having to worry about finding an electrical outlet or taking propane with you on your journey. That makes the GoSun Go such a great product and one that will become an essential part of your gear. Cooking and boiling: The way this product works is by reflecting the light that it captures from the sun which it then turns that light energy into heat energy, and traps it inside with vacuum insulation. It obviously gets a lot more technical than that but the end result is that it has over 80% efficiency whereas traditional solar panels have an efficiency of around 20%. The cooking time will be largely dependent on the amount of light available. When it’s cloudy though, different types of light are able to penetrate where visible light can’t and therefore the product is still able to cook as long as the sun is in the sky. While this sometimes takes a lot of patience, you will be in an environment where time isn’t going to be a huge issue and therefore this is never really a problem. The ability to get hot meals in an environment away from a regular heat source can be hugely heartwarming. The ability to boil water can also be essential too. Not only can this help make you tea or coffee but it can also be used to make meals that require hot water, meaning that you can carry more meal options. The capability to sanitize means that you never have to worry about being without safe water. Usability: One of the surprising aspects of this product is just how small it is. 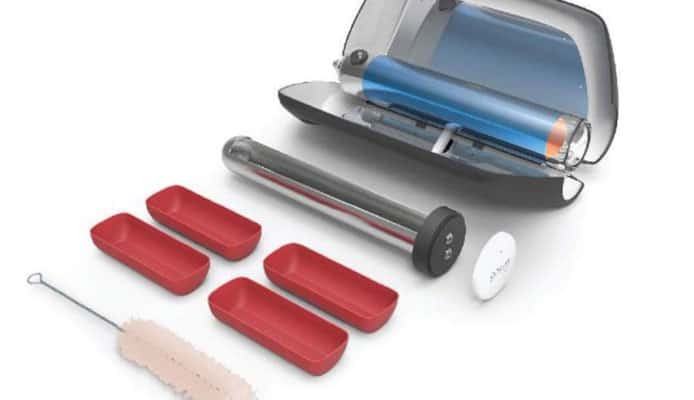 You’d expect that a solar device that is able to cook food would have to spread out over a very large area but instead is able to get the power it needs from a small amount of sun capture and is a great alternative to a portable grill. That makes the product highly portable as you easily be able to fold it up and attach it to a solar backpack or simply carry it with you. At just over two pounds, it’s very easy to hold too, which adds to its overall usability. The thin design of the tube means that sometimes you need a bit of imaginative food placement and timing, but you are able to quickly get used to it. The product is able to cook a whole range of different types of food and therefore you are not limited by what you can place in there. It’s very easy to maneuver too with the kickstand and you will be able to easily get it pointing in the right direction. The dial on the top is a useful way of getting the GoSun Go in the right position to be able to minimize your cooking time. Where to use it: This is where the GoSun Go can be extremely useful as it is going to be able to be used in a wider variety of different situations. You will probably buy it with one initial use in mind and end up using it for a much wider range of activities. It really excels in backpacking due to the fact that you can easily tie it on to your backpack or place it inside of it if you have enough space. This means that you are able to take dry meals and also have hot water whenever this is needed. There are plenty of other situations too and they would be great to use in a BBQ or to take to a picnic. Also, a boat is another example where you might be without a traditional method of being able to cook food. Like with solar watches or solar lanterns, the modern solar panels means that you are only going to need the sun to be anywhere in the sky to give them a great level of charge. This means that your GoSun can be used anywhere outside. The versatility that the GoSun provides gives it a huge level of value for money. The high build quality that it has will mean that it should be able to last for several years and in that time you are going to be able to repeatedly use it, whatever activity you are doing. This is a very impressive product and one that could revolutionize the way that food is cooked when you are outdoors. The small amount of light that it needs to work will also mean that you are not paranoid and constantly looking up to the sky, hoping for bright sunlight. Price: 100% – It’s hard to compare the price of the product to other items due to how unique it is, but on the surface it seems great value for money. It’s by no means cheap but the build quality together with the amount of use you’ll be getting out of it makes it great value for money. Material: 100% – As mentioned there, the product uses the highest quality materials available in order to make the device. The outer is highly durable and easy to grip, with the inside being made out of durable materials. The silicone trays are also very easy to use and handle. Design: 95% – It’s hard to criticize the design of this product, as it’s naturally heavily affected by the requirement to capture solar energy and for the tube to create a vacuum. The long tube design takes a bit of getting used to but it is easy enough and not an issue. Overall: 98% – The only thing that this product asks from the user is a little bit of patience but you’ll be buying the product with those cooking times in mind. 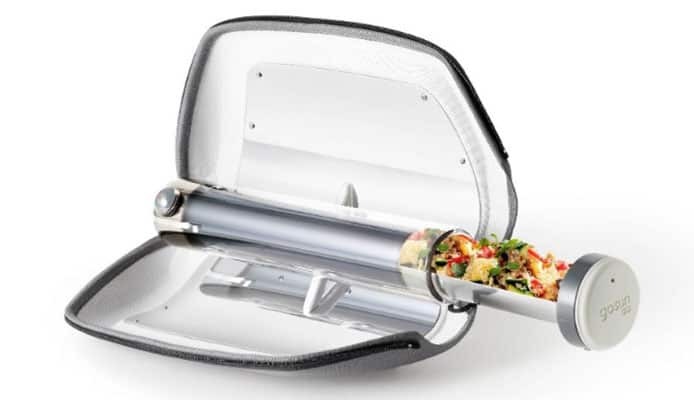 The GoSun Go aims to provide a portable and clean way of cooking and it achieves that aim remarkably well. 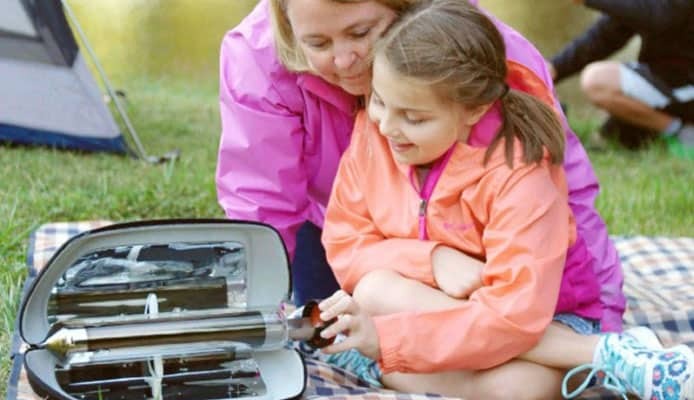 You can picture the scene now when you are in a camp and you pull out your GoSun Go device, you pick up items from your camping food storage and cook your favorite food, with many other campers looking on in amazement and looking for a propane burner or an electrical wire. They would be extremely impressed, as it is a remarkable device and one that is highly versatile. Not only do you get all the benefits that we have looked at here, but you also get the satisfaction knowing that you are using a product that is good for the environment and you don’t have to worry about getting rid of propane tanks for using fossil fuels. The aim for the GoSun Go is to be a convenient and portable device. However, the ability for it to be a life saver makes it even more important. The ability to boil water won’t only make water from natural sources safe but it can also be used to sterilize any equipment that you have too. 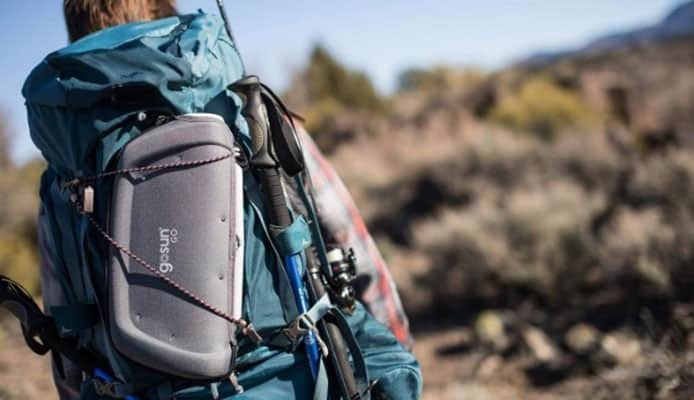 If you’re on a long backpacking trip, this will give you peace of mind as you know that you’ll always be safe. In most situations though, it’s simply going to be a great cooking device where you will be able to make delicious food. The meals coming out of the GoSun Go look great and it is easy to clean and can be used on a daily basis. The number of different uses that you will have for it will make it a product worth investing in. There are very few drawbacks to using the GoSun Go. The amount of heat that it can make from a small area with minimal sunlight is what sets it apart and makes it such a unique product. It is highly recommended will become an essential part of your traveling gear. Solar energy has come a very long way over the years but it hasn’t ever been powerful enough to be able to cook a meal or boil water with a portable device.